Currently questions and answers around NEPCA’s policies regarding the conference. What does NEPCA expect of conference presenters? What is NEPCA’s policy on refunds? Does NEPCA allow vendors to display at its annual conferences? Can vendors display wares if they do not attend? Does NEPCA allow attendees to promote their own work? NEPCA cannot issue refunds to those who register for the conference and do not attend. NEPCA will consider refunds in bonafide emergency situations, but these are the discretion of the NEPCA Executive Council. NEPCA understands that there are some circumstances beyond one’s control. The organization seeks to be understanding of those who do the courtesy of alerting conference organizers of emergencies and other misfortunes that prevent attendance. No refund will be issued for ex post facto contacts. NEPCA will reject future paper proposals for a period of three years. NEPCA will notify INS if a foreign presenter has traveled to the United States under a special visa and does not attend the conference. NEPCA is often contacted by deans, chairs, advisors, and others to verify attendance. It will not “cover” for those who do not attend. NEPCA is sometimes asked by other organizations to share names of non-attendees. The vendor must complete the form below and mail it to: Rob Weir, NEPCA Executive Secretary, 15 Woods Road, Florence, MA 01062 and enclose a registration fee of $100. The vendor assumes all responsibility for transporting materials to the conference, setting up displays, staffing the site, tearing down displays, and removing all items at the rise of the conference. Please note: NEPCA’s nonprofit status prohibits if from collecting money directly or indirectly engaging in direct retail activity. Vendors must assume responsibility for all monetary transactions. Vendors must ship all materials directly to the conference site. NEPCA cannot assume responsibility for transfers or pickups. Vendors should send only materials that can be displayed on flat tables. As an all-volunteer organization NEPCA does not have the personnel to assemble display racks or any other complicated set up. All materials will be considered donations to NEPCA. We cannot box and return items. Our policy is to assign books, DVDs, software, etc. to members for review in NEPCA Journal and to donate any items not assigned for review. NEPCA welcomes scholars that wish to advertise, promote, or sell their own books or other materials at annual conferences insofar as these materials are germane to the academic community. NEPCA is also happy to cooperate with nonprofit and nonpartisan organizations, community groups, and professional organizations. There is no fee for displays for individuals or nonprofit groups to display their materials. For-profit organizations must adhere to the NEPCA vendor polices outlined above. NEPCA’s nonprofit status restricts it from handling money for any private individual or outside group. All monetary transactions are the sole responsibility of the individual or nonprofit organization. Individuals and groups are welcome to advertise conferences, promote professional organizations, issue calls for papers, and promote other scholarly pursuits. NEPCA cannot promote or advocate political or private agendas. NEPCA assumes no responsibility for the content of or security of any materials displayed or distributed. Individuals and organizations must transport or ship all books, flyers, brochures, and other materials to the conference site. Those attending the conference must assume responsibility for set ups and displays and must remove all materials and take down displays at the rise of the conference. Individuals and organizations mailing or shipping materials for display and not attending the conference should understand that NEPCA will display items that can be placed upon tables. NEPCA will not assemble display racks or any other complex set up. NEPCA will not return unclaimed items. These will be donated or discarded at the rise of the conference. Content and promotion is restricted to matters that are purely educational in content. As a nonprofit organization NEPCA is not allowed to engage in partisan political behavior. We also meet on college campuses that sometimes have very strict rules on outside advocacy. 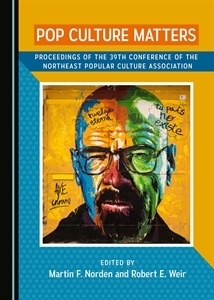 Those who seek further information on NEPCA policies or wish details on how to ship materials should contact NEPCA Executive Secretary: NortheastPopCulture@gmail.com.